The Belkin Flip F1DG102U is a 2 port USB KVM switch with Audio which allows you to connect two computers to one monitor and keyboard and "flip" between the computers using a simply touch button remote. Just place the remote anywhere on your desk and press to flip your monitor from one computer to the next. This KVM switch is great for connecting your old and new desktop computers, giving you instant access to files, programs, and games on both computers. Question: why is 1920 x1080 resolution not supported after connection of the KVM Flip switch model F1DG102U? Answer: Depending on your particular environment, there could be many reasons why you are not getting the expected resolution. Unfortunately, detailed product support is beyond the scope of this FAQ. We recommend contacting Belkin directly through their product support site. http://www.belkin.com/flip/support/. Thank you. Question: will this product work on windows 7 64 bit machine? Are there updates to firmware? Answer: Unfortunately, this product does not fully support Windows 7 and it does not appear that a firmware upgrade is forthcoming. For another option, IOGEAR states the https://www.kvm-switches-online.com/gcs632u.html provides the EDID support needed for Windows 7 to function properly. Answer: This Belkin Flip USB with Audio KVM Switch comes with a Belkin 3-Year Warranty. Question: can I use a wireless keyboard with this switch, if not which switch do I need? That being said, customers who attempt to use wireless keyboards and mice find Avocent switches, like this model: https://www.kvm-switches-online.com/4sv120bnd1.html, to work best. Alternatively, we have heard of some success when using a KVM equipped with a USB hub in addition to the USB console connectors. However, this typically results in some loss of functionality in regards to hotkey switching and other keyboard supported functions. Question: Will this switch work with XP and Win 7? Answer: Thank you for your inquiry. Unfortunately, while this Flip KVM works with Windows XP, it does not fully support Windows 7. Question: what cable do i require for a macbook? Answer: Thank you for your inquiry. This Simple 2-port flip KVM comes with all the required cables. As long as your MacBook has VGA and USB connections it should work as is. Answer: Thank you for your inquiry. Depending on the particular setup, it may work with Windows 8.1. However, Windows 7 and 8 are not listed as supported operating systems, and due to the new ways in which Windows 7 and 8.1 use EDID (Extended display identification data) and peripheral emulation, we would hesitate to recommend this KVM for those operating systems and could not guarantee compatibility. Answer: Thank you for your inquiry. Wireless keyboard and mouse usage with KVM switches is pretty hit-or-miss (and usually it's a miss). This is mainly due to the very different way in which wireless peripherals communicate as well as keyboard and mouse emulation used by the KVMs to simulate always connected devices - even when switched to a different target. It may work, but this is a very basic KVM and we are doubtful it would function properly with wireless devices. For the best results, it is important to have devices that each have their own wireless dongle and a KVM that supports transparent USB pass through. Sometimes you can use the HUB ports on a KVM if they are available, but that eliminates the ability to use any hotkey functionality. Generally, manufacturers will not support or guarantee compatibility with wireless keyboards and mice. For the best results, we always recommend using basic, wired devices. Having said that, this particular device (Belkin flip plus audio USB model F1DG102U) is used to share a Keyboard, mouse, monitor and speakers between two computers. There is no support for switching printers. 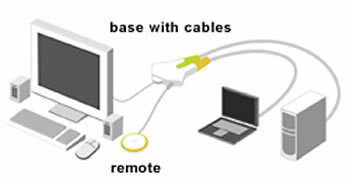 You would need a Dual-Monitor VGA KVM switch to switch between two dual-monitor VGA USB computers.